Earning badges has always been a key part of Scouting. The wide range of badges available also adds variety to our programme. 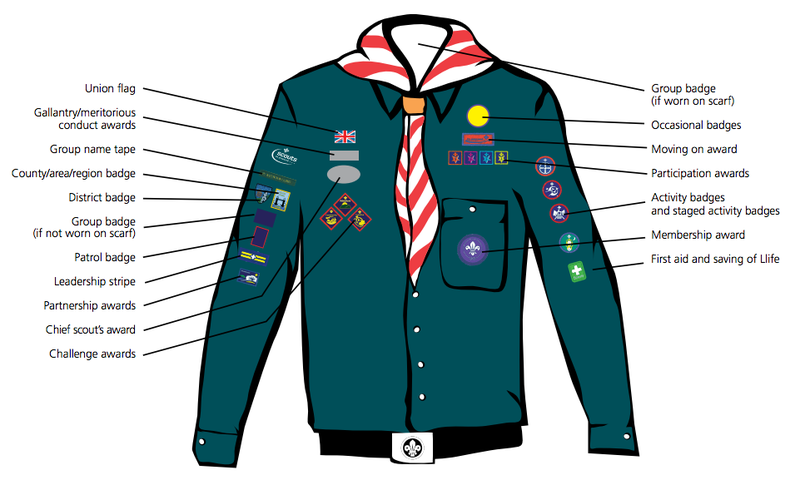 Some badges are covered at Scouts, and some you can do yourself at home, or at a club. This page also tells you where to sew them on your uniform! For a really good summary of the latest (2015) training programme, see the 3rd Billericay Scouts site. Many activity badges reflect participation in extra activities, or personal interests, sports and hobbies, and so are undertaken by individual Scouts outside meetings. We generally ask you to print out the page from the link above and ask a club leader, sports instructor or parent to sign it – but please speak to a leader first, as the requirements are important. Staged badges are activity badges that can be taken in any section (Beavers, Cubs or Scouts), and reflect continuing development of skills in activities such as swimming and music. A Scout should be able to earn the challenge badges through taking full part in the programme during his or her time in the Troop. Your parents will probably be happy to teach you to sew on badges if you promise to do, say, a week’s washing up in return for the instruction!